it’s not like we have somewhere to go. Monday, November 30, 2015: It is currently 0330 hours on a cold morning in late November. The cricket’s roared and Owl hooted as our two intrepid (or is that inept?) wanderers leapt from their deep slumber to enthusiastically greet day one of their six month winter RV trek to parts of America yet to be decided. The cricket sound was actually emanating from Kit’s iPhone alarm, however our resident backyard Owl was in fine hooting form on this late fall morning. Also, the term “leapt” needs to be taken with a grain of salt, or two…..not unlike a good Tequila which results in less morning leaping……don’t ask how I know that! 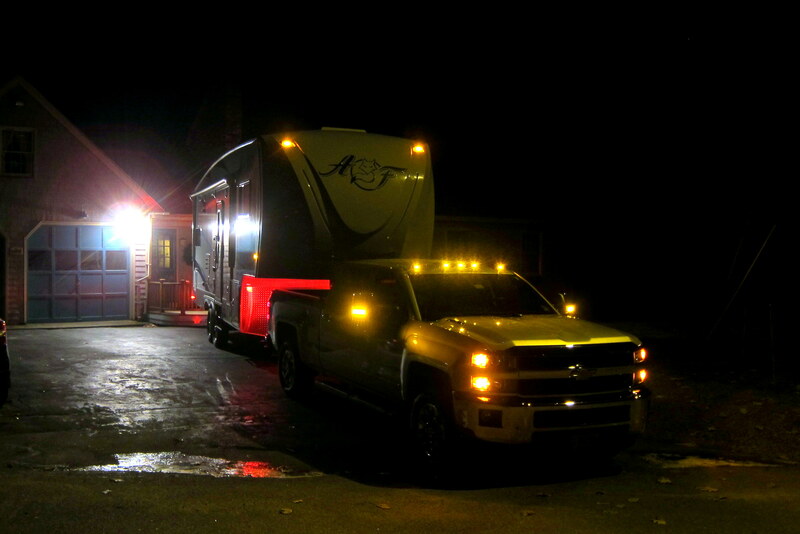 After loading the adventure-mobile with a few last minute items, warming the diesel engine sufficiently to pull the 12,000 pound camper and filling our coffee travel mugs we are ready to roll. Kit and I trust that all had a great Thanksgiving holiday, or as our daughter calls it, The Festival of the Beige Food. For the past few years our family has merged Christmas with Thanksgiving into what has become known as “Thanksmas”. Our gathering this year included our Maine family (no pun intended) and a couple of the kid’s friends. 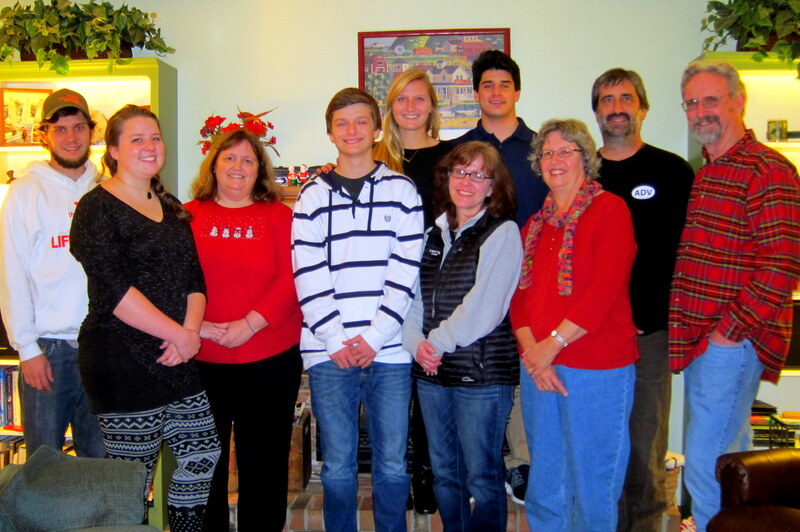 Our grandson Joe and his girlfriend Abby and cousin Katie once again handled the food prep and it was outstanding! We had a great time and were able to say goodbye to everyone before heading south. As we quietly roll through the sleepy streets of our hometown in Midcoast Maine, the skies are clear and the temperatures hover near twenty degrees. Every year I marvel at the civil engineering masterpiece that allows us to pull out of our driveway and utilize an interconnected roadway system that provides wheeled travel to many corners of our great nation……thanks President Eisenhower! The fact that we would actually be on the road today had been in doubt. Earlier this month I took the camper to John at my preferred RV shop for its annual maintenance of repacking the wheel bearings and checking the brake systems. Now keep in mind, our current unit is only 10 months old and has been performing flawlessly. However when John removed the wheels and drums he discovered this! That is one of our brake shoes and it isn’t supposed to have chunks missing! 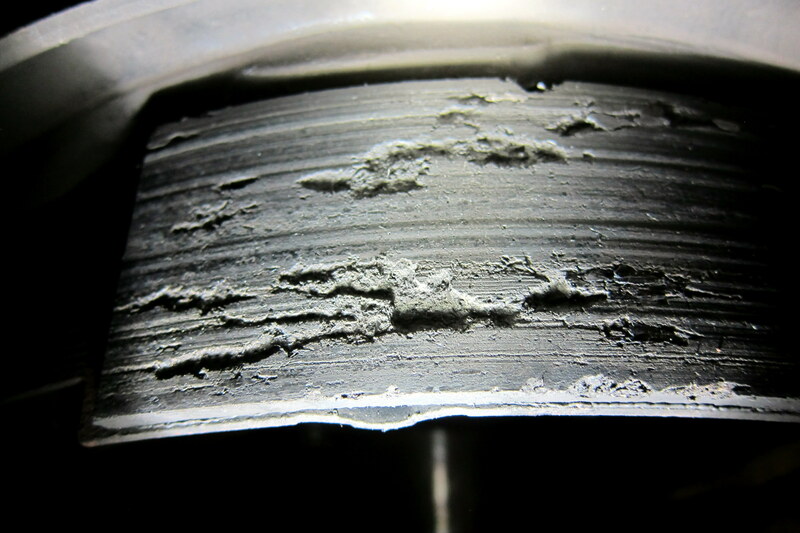 A few scratches and some reduction in thickness is normal for the miles we have on the camper but that level of deterioration is definitely not normal…..and this condition affected two of the four brake assemblies! A quick call to our dealer in San Diego resulted in a call to the trailers manufacture which resulted in a call to the maker of the axle assemblies, Dexter Axle. The good news was that all would be covered under warranty and the better news was that Dexter agreed to replace all four brake assemblies and their drums…..essentially giving us brand new equipment supporting all four wheels! The bad news was that these parts weigh over 200 pounds and shipping by surface freight would take a few weeks. Following a plea from us that the shipping time would impact our desired departure date, Dexter agreed to ship the parts via FedEx and they arrived in three days. That was great…..however it was also Thanksgiving week where John and his crew were to take a well-deserved four day weekend. The parts arrived on Tuesday morning, John replaced all four brakes and drums, adjusted and road tested the camper, and performed a final adjustment all before closing shop! All is good in Bill and Kit Excellent Adventure world! 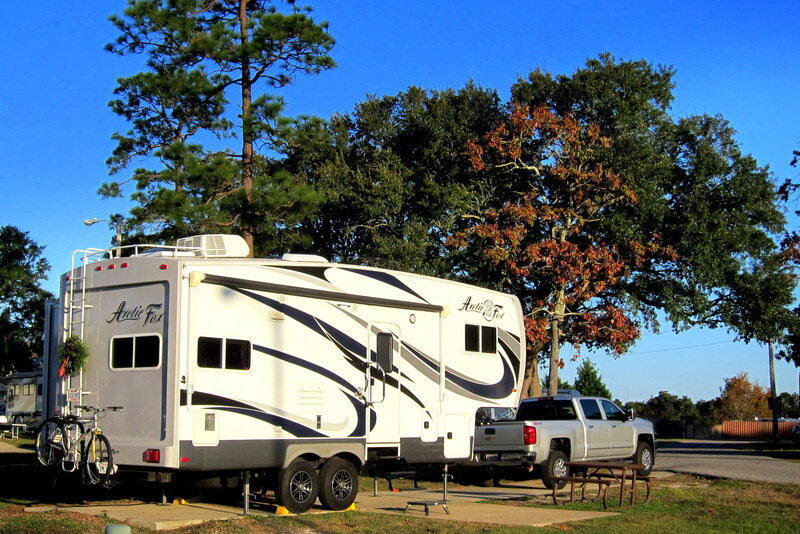 A quick personal endorsement of the crew at Coastal RV, www.coastalrvrepair.com. If you need any work performed on your rig, I highly recommend them! So, with renewed confidence in RV manufacturing and repair folks, Kit and I trundle south on I-95. At 0503, as we pass the town of Saco, I dutifully honk the trucks horn as requested by or friends Randy and Jean…..did you folks notice? Following a brief stop at the Kennebunk Travel Plaza to check wheel temperatures and tire pressures, we continue into New Hampshire and soon enter the state of Massachusetts where we stop at a Mass Pike Travel Plaza for food, fuel and some walking about time. Back underway, we connect to I-84 and continue west into Connecticut. Soon the formerly moderate traffic began to slow, eventually coming to a crawl. Yep, some hapless commuter made his Monday even worse by playing bumper cars with a fellow motorist. There were two travel lanes clear and the highway patrol folks were on scene trying to get folks to keep moving, but alas everyone in front of us felt a need to roll slowly by the scene and observe the aftermath. Over the years, we have labeled this voyeuristic quirk of human nature to ogle another motorist’s misfortune as “An Accidental Roadside Attraction” (pun intended). Passing the scene of the accident and getting a nice long look, we were rolling through the state of New York by mid-morning. Historically, I steer far north of the big scary city of nine million souls and ten million bright yellow taxies. 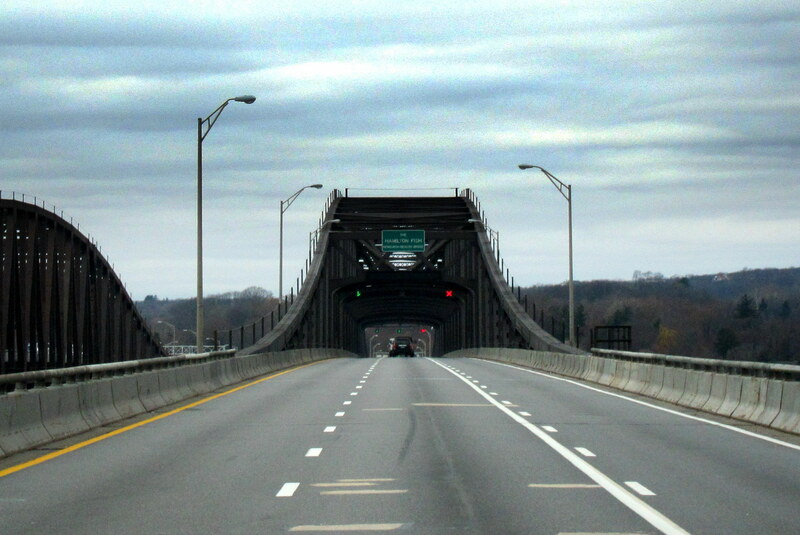 They don’t take kindly to a rube piloting his forty five foot recreational vehicle anywhere near their domain so I choose to cross the Hudson River by way of the Hamilton Fish Bridge. 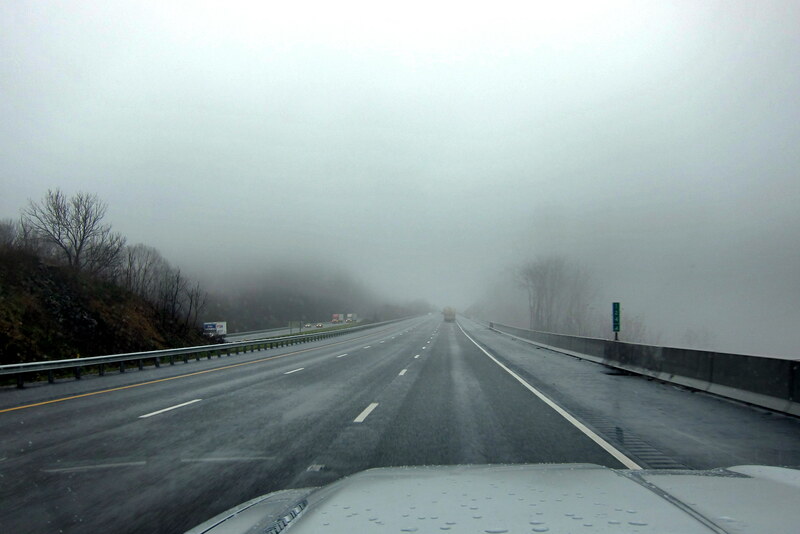 As you can see in the photo above, the skies have become overcast and around noon, as we cross the Delaware River into Pennsylvania, it begins to rain. The temperatures are in the mid 30’s so icing isn’t a big concern but we slow our travel and proceed cautiously anyway. Outside Scranton we hop on I-81 and head south. The rain increases in intensity as the temperature continues to rise. 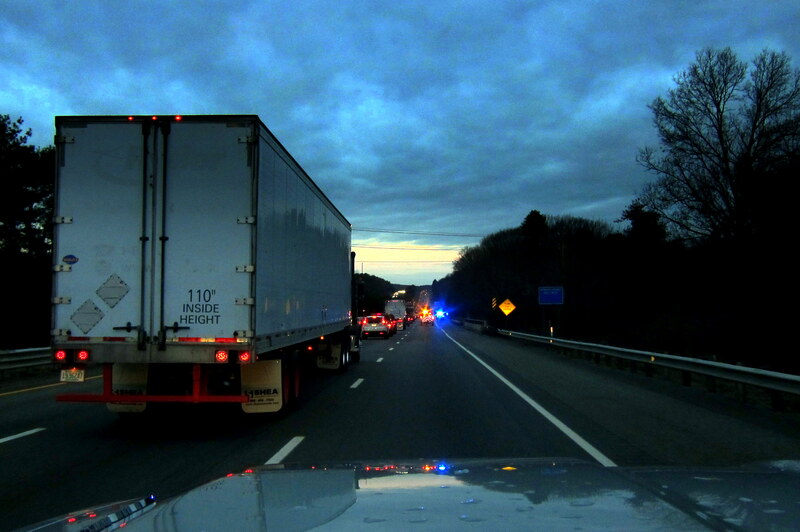 I-81 is a major north-south long haul trucker route and at least half the vehicles along this interstate are professional truckers hauling their goods to market. We feel very safe traveling side by side with these huge rigs, much more than traveling next to a local commuter that possesses this uncontrollable urge to get around us only to slow and exit. The afternoon was uneventful as we slowly ticked off the miles while stopping frequently for time to stretch our legs, to grab a snack in the camper or for fuel. At 1610, we pulled into an Applebee’s Restaurant for an early dinner after which we made our way to our traditional first night lodging at a nice Fairfield Inn outside the Pennsylvania town of Carlisle. 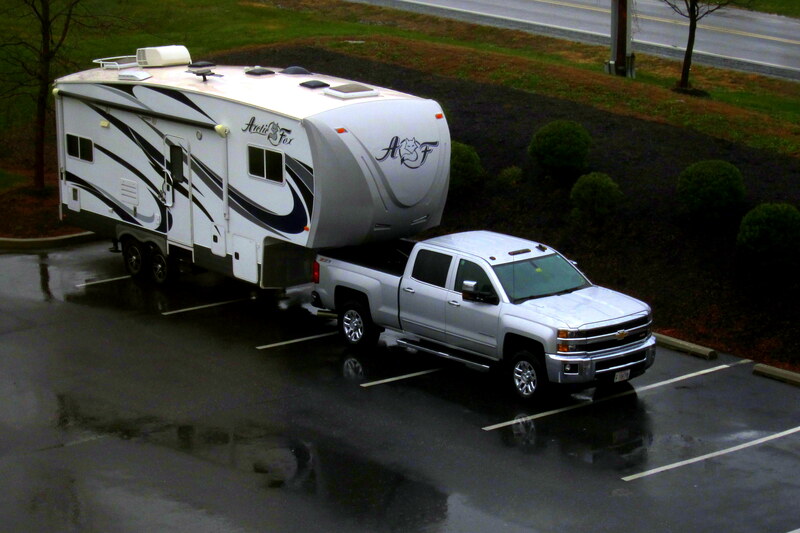 So, why haul a 30 foot camper 574 miles only to stay in a hotel? Well, to begin with the camper is winterized and not ready for overnight accommodations, and secondly after thirteen hours on the road we are in need of some pampering. After a few fresh baked cookies and a mug of hot chocolate, we retired for the evening…..goodnight! Tuesday, December 1, 2015: Kit and I are up at a reasonable hour following a very restful sleep. Looking out our 3rd story window at the camper I noticed a lot of rain…..fortunately the temperatures were in the 40’s so it should be an OK travel day. We enjoyed a very nice complimentary Continental Breakfast and hit the road at 0949 for points south. 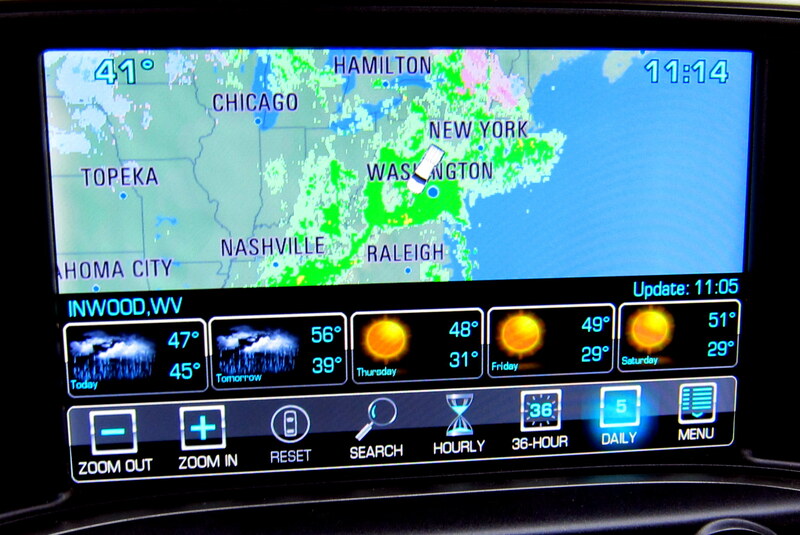 The Weather App on the trucks information screen showed a slug of rain coming from the west courtesy of winter storm Melvin. However the traffic was light and we plodded along stopping only for exercise, lunch and fuel. The only excitement of the day was when an unusual sound suddenly started to be heard from under the rig. I was 90% sure it was tire noise from a change in road surface, but there was that 10% chance that something could be seriously wrong. Decided to pull off at the next exit and as soon as we hit the off ramp the noise disappeared. 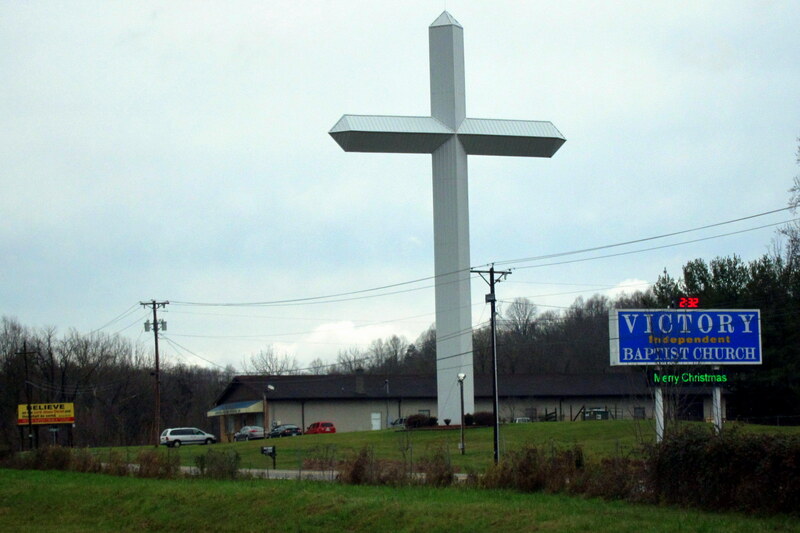 I took the opportunity to park the rig and check everything out anyway…..happy to report that all was OK.
At 1045 we crossed the Mason Dixon line and immediately started seeing billboards for the Waffle House, Bojangles and the ubiquitous giant crosses. Crossed into West Virginia at 1057 hours and on into Virginia at 1124. An uncontrollable urge came upon us to shift the Sirius XM radio system to Willies Roadhouse! Listening to Willie, Waylon and the boys completed the southern immersion! 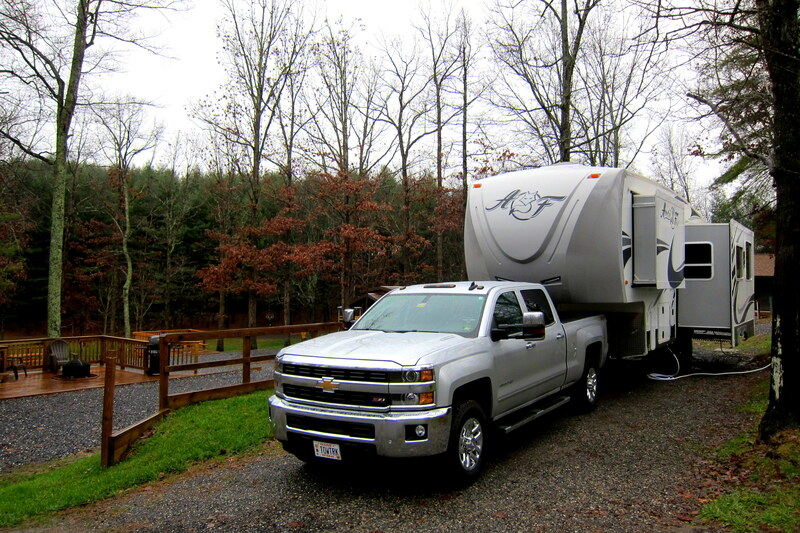 Deciding it was far enough south and going to be warm enough to sleep in the camper, we pulled off the interstate in Lexington, Virginia and located a Wal*Mart to re-provision. Back underway, we used the iPhone App “All Stays-RV” to locate a highly rated campground in the small town of Natural Bridge, Virginia and at 1545 we pulled in for the evening. As I recommissioned the camper, Kit made up a delicious meal which we enjoyed with a nice Cabernet and a loaf of fresh homemade bread thoughtfully provided by our neighbor back home. After some time on the iPads it was off to snoozeville. Wednesday, December 2, 2015: Up to cool and rainy weather. Following breakfast we called our grandson Jack to wish him a Happy Birthday. We broke camp, and by 1007 hours Kit and I were back on I-81 heading south. Another long slow travel day as we tried to head far enough south where we can feel reasonably sure it will be safe to make a right turn and head west. 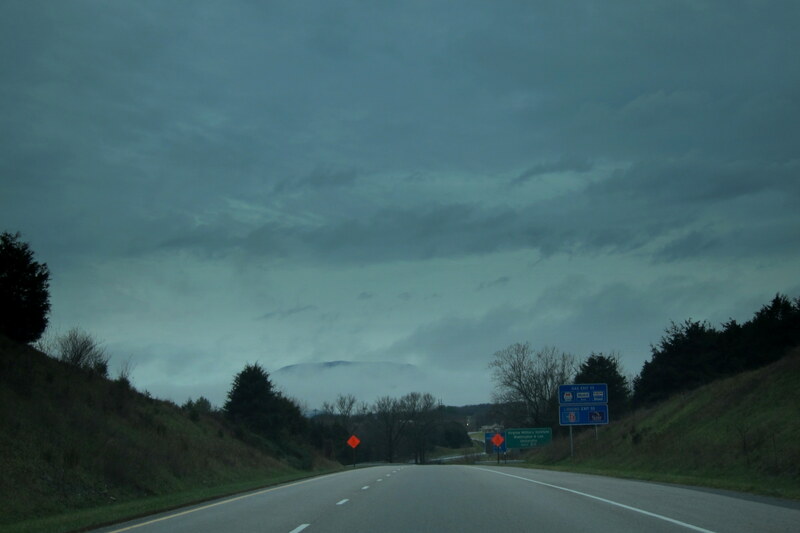 Other than the occasional stop for some exercise, fuel or food we doggedly meandered along crossing the Tennessee border at 1332 and then moving over to I-40W before intercepting Interstate 75 which led us further south. The weather suddenly cleared and the sun popped out which raised our spirits enough that we decided to celebrate by stopping early. So at 1645 Kit found us another very nice camping opportunity in Athens, Tennessee. Simply called The I-75 Campground, it was an ideal stop for an overnight stay…..convenient, rustic and cheap, just our style! As the name implies, I-75 Campground is alongside the interstate…..however there was very little traffic noise as it was drowned out by the rushing waters of nearby Mouse Creek. As you can see, Mouse Creek is anything but mousey. 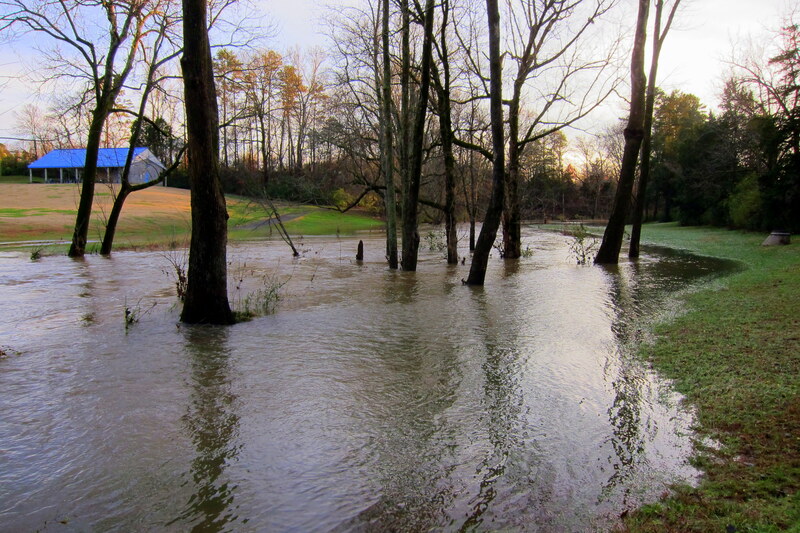 The relentless rain of Superstorm Melvin caused the normally placid creek to spill over its bank and flood the surrounding area. Even though the rain had cleared out, there was a damp chill in the air as the sun set over the western hillside. 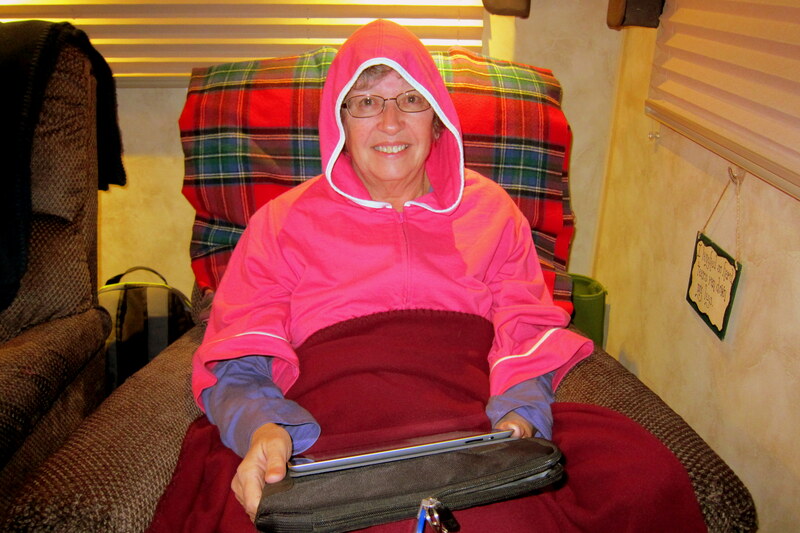 Never the mind…..Kit was content to bundle up and enjoy some iPad time before calling it a day. Thursday, December 3, 2015: After a very restful night Kit and I woke to sunny skies with temperatures in the mid 40’s. Following our morning routine, we were on the road heading south before 1000 hours. Forty-five minutes later found us rolling through Chattanooga, Tennessee and at 1057 entering the state of Georgia. A mere twenty minutes later we were crossing the border into Alabama and encountered the Central Time Zone. Getting close to the noon hour and needing a break, we pulled the rig into a highway rest area outside the town of Springvale. While Kit prepared lunch, I did my daily check of tire pressures and temperatures and looked for anything else possibly amiss on the rig. While so engrossed, a young fellow happened by and noticing the rescue bicycle hanging off the back of our camper, struck up a conversation about bikes. 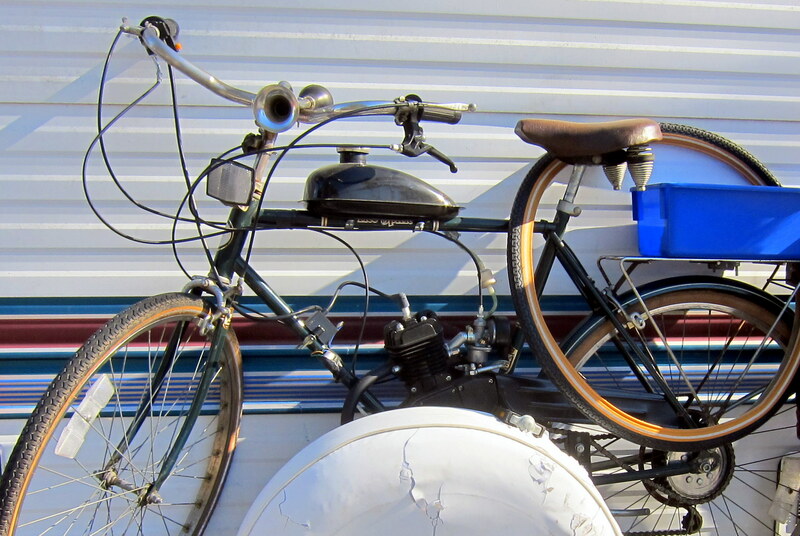 Billy, mentioning he was also a “loose bike nut” (a rather dangerous affliction) led me to the rear of his camper to inspect his motorized bicycle. Imagine my surprise when I spotted the Maine Plate! And an even bigger shock when he mentioned he grew up in Topsham, a neighboring town across the Androscoggin River from where Kit and I reside! And both being rather small towns we knew many of the same people! As a youngster, Billy lived near the Middlesex Road on Pelletier Pond and his father owned much of the land that became the housing development, Bay Park! His sister, Jeannine still lives in the area and her best friend Linda is also a friend of Kit’s! So Billy rang up his sister in Maine and handed to phone to Kit where they discovered even more mutual friends…..a small world indeed! Billy is an accomplished musician playing guitar in a variety of bar bands in Maine as well as the south. 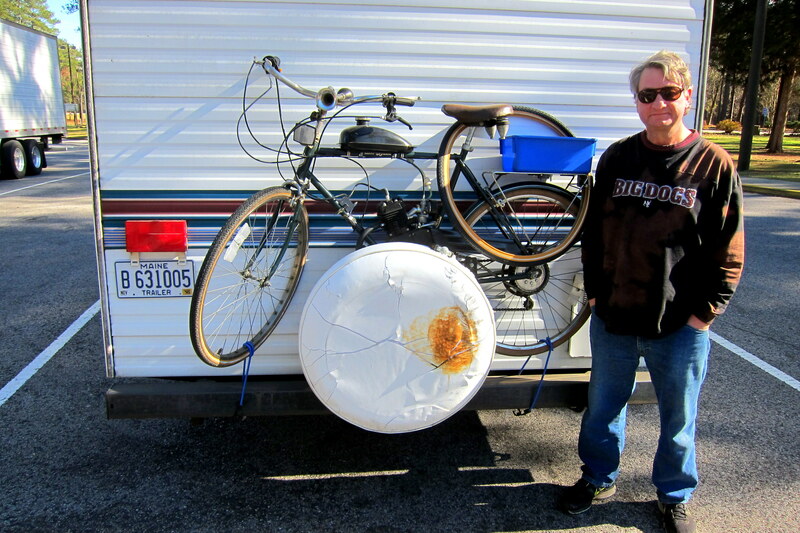 He currently resides in Foley, Alabama where in addition to his music career he builds and sells motorized bicycles. Sourcing the parts from Canada and locating a suitable donor bike, Billy creates these diminutive motorcycles using small gasoline engines keeping the horsepower under the limit that would require registration and licensing in most states. However, Billy’s real claim to fame, at least in the south, is as a musician in an Alabama rustic country band where he plays lead electric saw! Um, that takes some splanin’…..not a traditional “electric saw” with a spinning 7 inch blade, Billy’s electric saw is an old Stanley crosscut handsaw that he modified with an electric guitar pickup and controls. 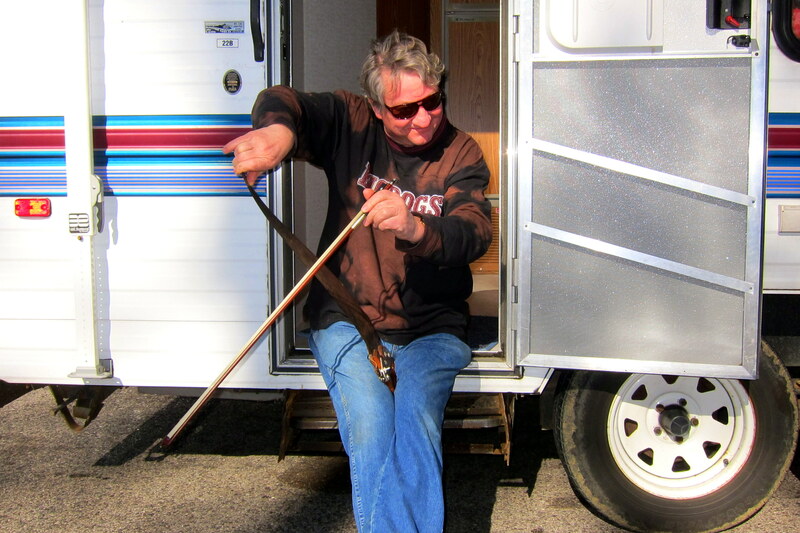 Sitting in the threshold of his camper, and with 18 wheelers pulling in and out, Billy grabbed a violin bow and played us a wonderful rendition of “Somewhere, Over the Rainbow”! Welcome to the never-ending cast of interesting characters that enrich our experience on the roads of America!! After an hours break we were back on I-75 continuing southerly looping around Birmingham on I-459 until we encountered I-65 which we took on into Birmingham. 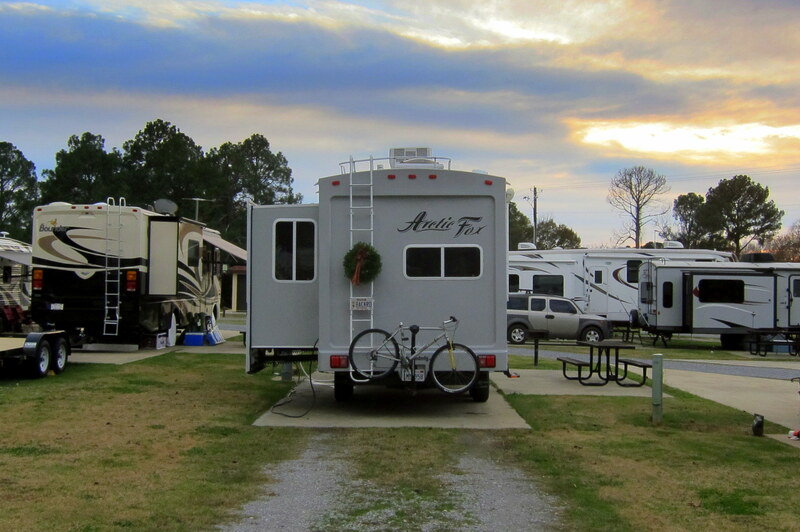 Nearing our self-imposed daily time/distance cutoff parameter, Kit called Maxwell/Gunter Air Force Base to see about vacancies in their base campground…..fortunately they could squeeze us in. 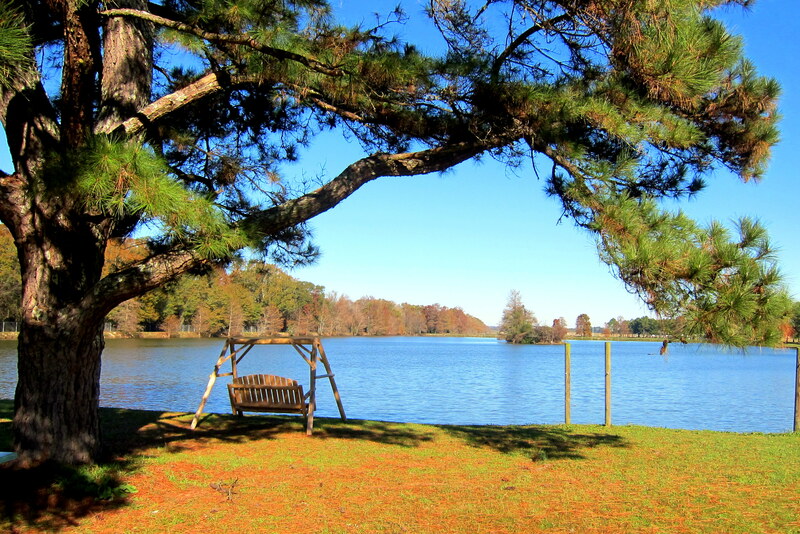 This military campground was built alongside a manmade lake and features full hookups and ample recreation opportunities. A nice place to overnight and a nice destination campground as well. About half the population of the campground appears to be active US Air Force families assigned to the base. It was nice to see kids romping about and exploring the woods and waters of the area. After a cocktail, nice meal and some reading time it was an early turn in evening after an interesting day on the road. Friday, December 4, 2015: Up to clear skies and temperatures rising into the 50’s. Kit and I took a stroll about the park before breakfast and breaking camp. Heading out at 1000 hours we rejoined Interstate 65 and continued south. After two hours of easy driving we pulled off the highway and into a rest area for a break and a bit of walking. Entering the visitor’s center I spotted Leo being cuddled by his owner Emily. I couldn’t let this opportunity pass, so after an exchange of courtesies I was allowed to hold Leo. 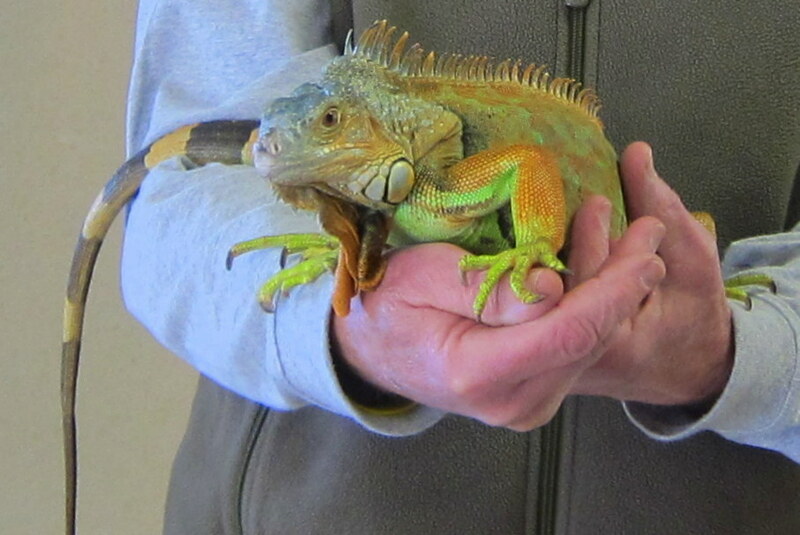 Leo is an adorable Iguana and very docile. 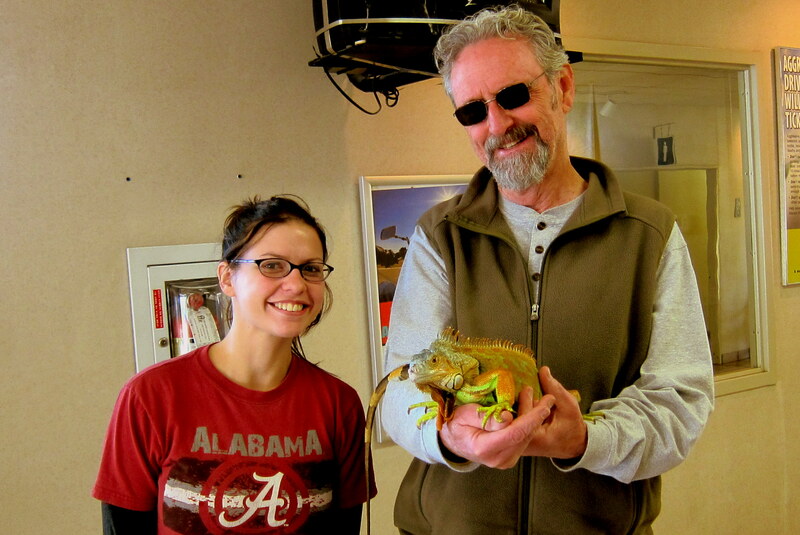 His coloring is incredible and, according to Emily he makes the ideal pet. Leo’s diet is principally lettuce and chocolate fudge! He has his own FaceBook page…..just look up Leo Isbell to follow his adventures. Wow, two consecutive days and two encounters with very interesting people…..we are on a roll! (No pun intended). After our visit with Emily and Leo we once again hit the road toward the south. 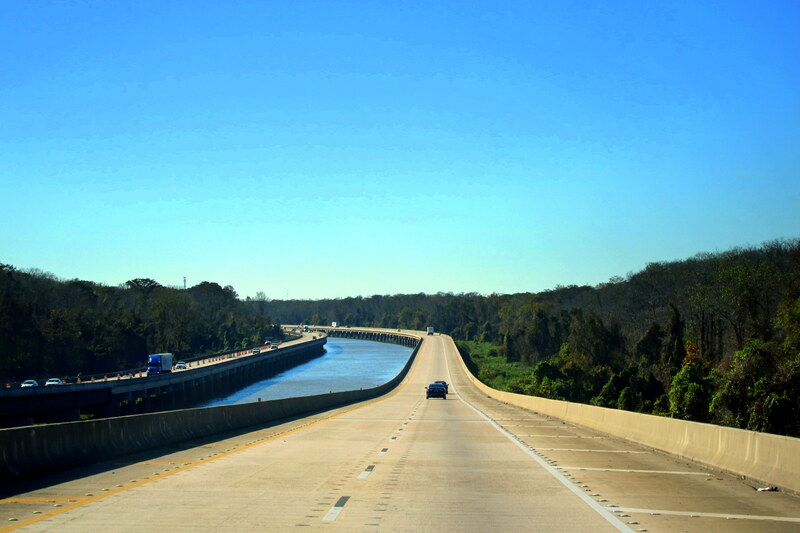 Just outside Mobile, Alabama we crossed the Tensaw River Delta via an elevated roadway. At 260,000 acres, this National Historical Landmark is the largest wetland in Alabama and drains a significant amount of water from LA (lower Alabama) into Mobile Bay. 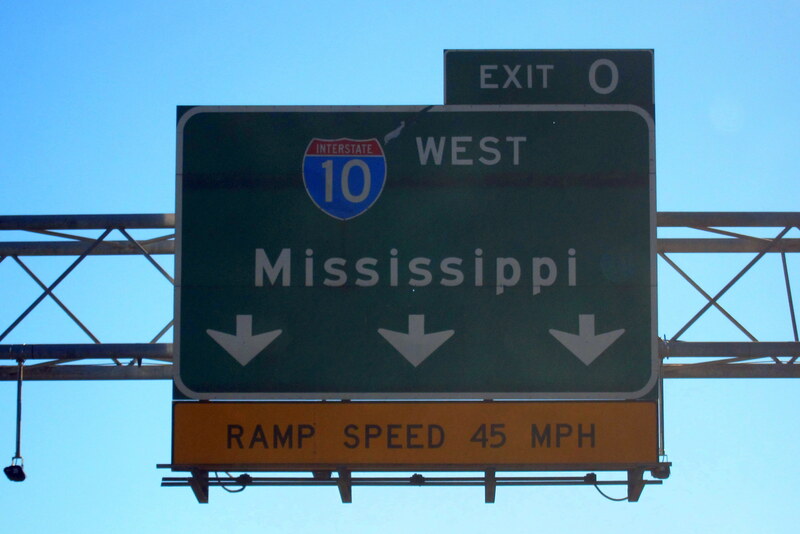 Interstate 65 abruptly ends at I-10 resulting in one of the few Exit 0’s we have encountered over the years. 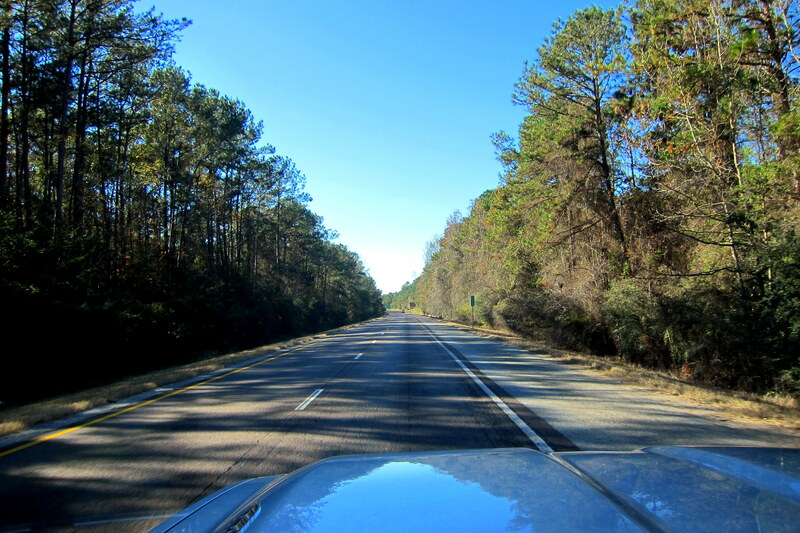 Deciding it was time to head west…..we turned right and followed I-10 on into Mississippi stopping at the Welcome Center to call ahead for availability at the Keesler Air Force Base campground. They don’t take reservations, but said to come on in as they will hold a site open for us! 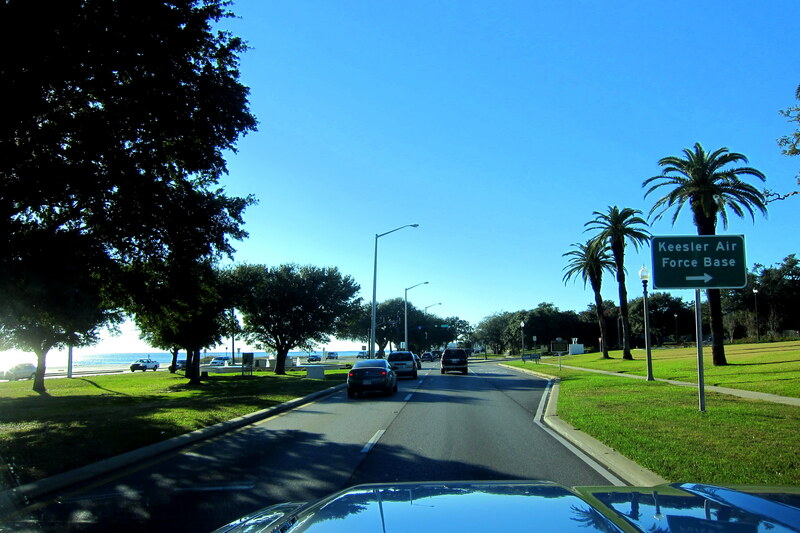 Dropping down onto the more scenic US-90 we continued west till arriving at the town of Biloxi. Pulling into the campground we set up for a few days stay. We intend to explore this portion of the Mississippi Gulf Coast and visit with an old friend from Maine who is stationed in Keesler……stay tuned! Kit’s Bit’s: We’ve gotten off to a pretty good start on this year’s adventure. So far, the trip has been much easier than previous trips. About the only thing I can attribute this to, is the fact that our new camper is way more comfy than the previous one. Now, mind you, it’s a little longer and much taller which gives Bill more to fuss about but he even seems to be way more comfortable in it, although he would never admit it. As I sit here typing, he is enjoying sitting in his Lazy Boy recliner – something he swore he would NEVER even use! Yes, I think we made the right decision, despite all my nagging and his endless research. Looks like you’re off to a good start. Love Leo but I don’t think Chloe (our cat) would, heck, Leo whip her with his tail. Stay safe and as always we look forward to your adventures. I like Ike. How can you go wrong with the U.S. interstate highway/landing strip system. Eisenhower had it right, build infrastructure and provide jobs. A improvement still serving us today. Have a great and safe trip, hope to see you guys soon. If you have time San Felipe would make a great side trip. GOOD MORNING, 40 DEGREES HERE AND PRETTY BALMY FOR ALMOST MID DECEMBER. THOSE PALM TREES IN THE FINAL PICTURE SURE LOOK INVITING. I GUESS WITH OUR LAB BELLE JUST TURNING 13, WE’LL NEED TO BE CONTENT STAYING RIGHT TA HOME. THIS WINTER WILL AT LEAST NOT SEEM AS LONG WITH THE TEMPS HOVERING AROUND 50 DURING THE DAY. STAY SAFE AND GREAT TO AWAKE TO THE NEW ADVENTURE SERIES. Good to know you are back on the road again…figured it was jut about the right time. I will have Roger check our wheel drums on the trailer…just as precautionary thing…..we picked up our Arctic Fox May 12 at LaGrande…and love it. Spent 54 nights in it between May 12 and Aug 31. And of course, now back on Snowbird Mesa, where it is REALLY kite flying weather this winter….cold front moving through today and another one tomorrow… and have clocked 26 mph thus far this morning. 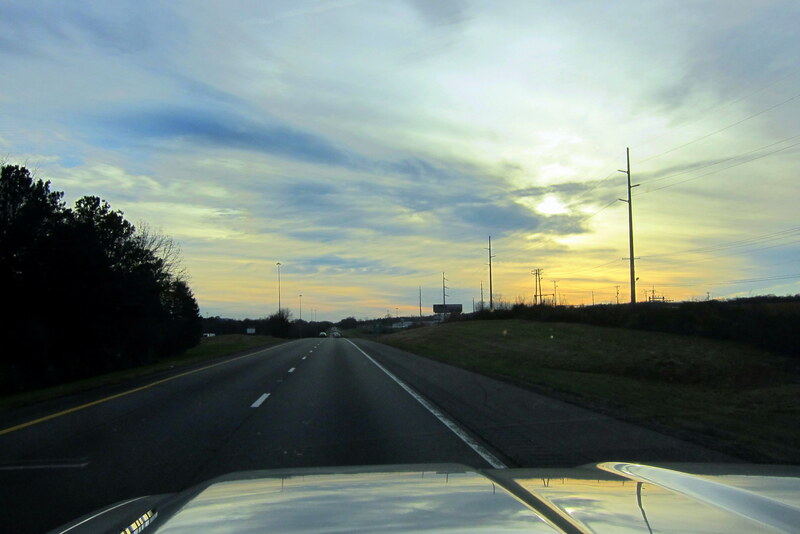 Have a good trip…good to know you are enjoying the good life on the road! Glad you have good brakes now. Without them, it is a long roll downhill from Maine to the Gulf Coast. Sounds like you guys have gotten off to a great start. 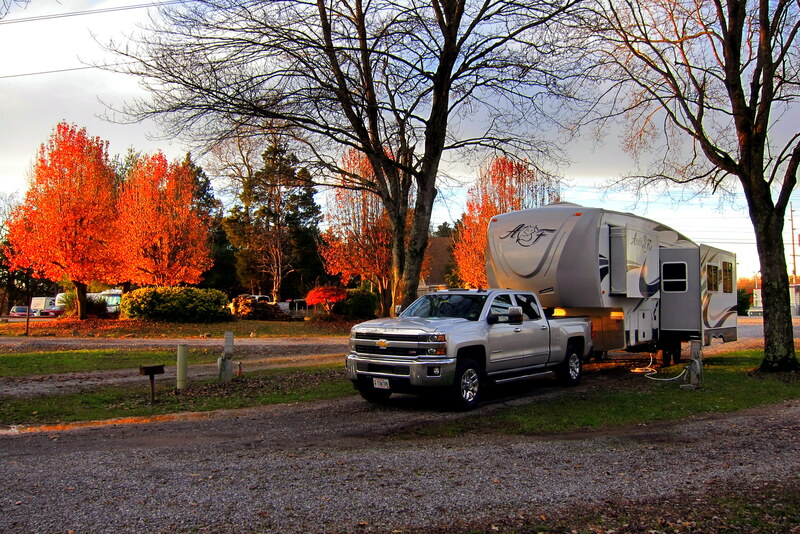 Both Bob and I are looking forward to the day we head out of Maine for points south in our new 31 foot RV However it won’t be anytime soon, probably next Spring. In the meantime, I look forward to reading all about your adventures on the highways and byways of America. Wow this is fantastic to read and really interesting, I have recently booked to come to the states for two weeks, my plane is to arrive in San Francisco then making my way through to Dallas via Death Valley, Denver and San Antonio all by road so seeing and reading this is fantastic and just makes me more excited!